Recombinant fragment corresponding to Human NUP98 aa 1-466. WB: HeLa nuclear lysate. Jurkat, HeLa, COS-7, NIH/3T3 and SH-SY5Y cell lysate. ICC/IF: HeLa and NIH/3T3 cells. Our Abpromise guarantee covers the use of ab50610 in the following tested applications. WB Use a concentration of 0.5 - 1 µg/ml. Detects a band of approximately 98 kDa. Dot blot Use a concentration of 0.5 - 1 µg/ml. ICC/IF 1/100 - 1/200. Customers have reported that Paraformaldehyde/Triton x-100 fixation provides better results, with sharp, regularly punctuate perinuclear signals. In MetOH fixed cells, the signal intensity can be somehwat lower and fuzzier and that single nucleoporin dots can be harder to distinguish around nuclear chromatin. Please see images below. Nup98 and Nup96 play a role in the bidirectional transport across the nucleoporin complex (NPC). The repeat domain in Nup98 has a direct role in the transport. Note=A chromosomal aberration involving NUP98 is found in a form of acute myeloid leukemia. Translocation t(7;11)(p15;p15) with HOXA9. Translocation t(11;17)(p15;p13) with PHF23. Note=A chromosomal aberration involving NUP98 is found in childhood acute myeloid leukemia. Translocation t(5;11)(q35;p15.5) with NSD1. Translocation t(8;11)(p11.2;p15) with WHSC1L1. Note=A chromosomal aberration involving NUP98 is found in a form of therapy-related myelodysplastic syndrome. Translocation t(11;20)(p15;q11) with TOP1. Note=A chromosomal aberration involving NUP98 is found in a form of T-cell acute lymphoblastic leukemia (T-ALL). Translocation t(3;11)(q12.2;p15.4) with LNP1. Note=A chromosomal aberration involving NUP98 is associated with pediatric acute myeloid leukemia (AML) with intermediate characteristics between M2-M3 French-American-British (FAB) subtypes. Translocation t(9;11)(p22;p15) with PSIP1/LEDGF. The chimeric transcript is an in-frame fusion of NUP98 exon 8 to PSIP1/LEDGF exon 4. Belongs to the nucleoporin GLFG family. Contains 1 peptidase S59 domain. Isoform 1 to isoform 4 are autoproteolytically cleaved to yield Nup98 and Nup96 or Nup98 only, respectively. Cleaved Nup98 is necessary for the targeting of Nup98 to the nuclear pore and the interaction with Nup96. 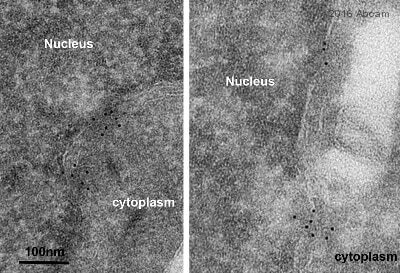 Nucleus > nuclear pore complex. Nucleus membrane. Nup96 is localized to the nucleoplasmic side of the nuclear pore complex, at or near the nucleoplasmic basket. Immunocytochemistry/ Immunofluorescence - Anti-NUP98 antibody [2H10] (ab50610)Di Nunzio et al PLoS One. 2012;7(9):e46037. doi: 10.1371/journal.pone.0046037. Epub 2012 Sep 25. Fig 1. Lentiviral vector-encoded shRNAs achieve efficient knock-down of human nucleoporins and have negligible cytotoxic or cytostatic effects. HeLa cells (4×106) were transduced with lentiviral vectors (MOI 50) encoding shRNAs specific for the indicated nucleoporins and used at 2 days p.t for Nup153 shRNA and 5 days p.t for all others. (Panel B) Subcellular localisation of nuclear pore components upon nucleoporin knock-down was tested by confocal fluorescence microscopy of LV- (Control) and LV-shRNA transduced cells using specific anti-Nup antibodies. Images were acquired on the same day with the same conditions and are representative of two independent experiments. ab50610 (1/100) staining NUP98 in HeLa (Human epithelial cell line from cervix adenocarcinoma) cells (green). Cells were fixed with paraformaldehyde/Triton X-100 [10 min in PTEMF buffer (20mM PIPES, 1mM MgCl2, 10mM EGTA, 4% PFA) /0.2% Triton X-100 at room temperature] or methanol (6 min in methanol -20 °C , followed by 3 washes in 1x PBS) and counterstained with DAPI in order to highlight the nucleus (blue). ab50610 (1/100) staining NUP98 in NIH/3T3 (Mouse embryo fibroblast cell line) cells (green). Cells were fixed with paraformaldehyde/Triton X-100 (10 min in PTEMF buffer (20mM PIPES, 1mM MgCl2, 10mM EGTA, 4% PFA) /0.2% Triton X-100 at room temperature) or methanol (6 min in methanol -20 °C , followed by 3 washes in 1x PBS) and counterstained with DAPI in order to highlight the nucleus (blue). 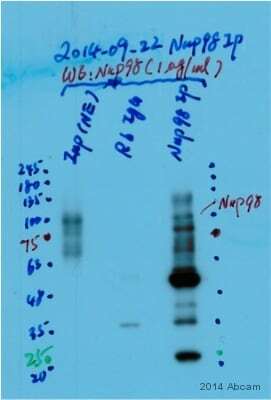 Immunocytochemistry/ Immunofluorescence - Anti-NUP98 antibody [2H10] (ab50610)This image is courtesy of an anonymous Abreview. Paraformaldehyde-fixed, 0.5% Triton X-100 permeabilized HEK-293T (human epithelial cell line from embryonic kidney transformed with large T antigen) cells stained for NUP98 (green) using ab50610 at 1/200 dilution in ICC/IF, followed by Donkey Anti-Rat Alexa Fluor® 488. Publishing research using ab50610? Please let us know so that we can cite the reference in this datasheet.